A baby is a very young human who is born when a mother gives birth. A baby is called a newborn for the first 1 to 3 months of life. They are then called a child until about the age of three years old, and a preschooler between 3 years old and school. An infant is a human child at the youngest stage of life. Some people say that infancy is until someone can walk, while some say infancy is the time before the age of one. 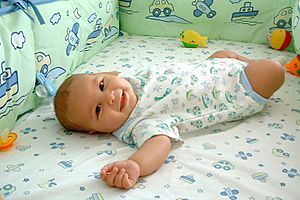 An infant less than 1 month old is a newborn. Newborns can be premature infants, post-mature infants and full term newborns. 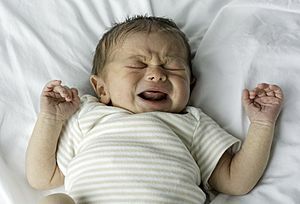 The word infant comes from Latin, meaning "unable to speak". After learning to walk, infants are called toddlers, usually when they are 1-3 years old. Over the first 5–7 days following birth, the body weight of a baby decreases and is largely a result of the resorption and urination of the fluid that initially fills the lungs and until breastfeeding becomes effective. After the first week, healthy babies should gain 10–20 grams/day. Breastfeeding is the recommended method of feeding. Baby Facts for Kids. Kiddle Encyclopedia.